Thames foreshore access including metal detecting, searching and digging. > Thames foreshore access including metal detecting, searching and digging. Anyone wishing to search the tidal Thames foreshore in any way for any reason must hold a current foreshore permit from the Port of London Authority. The PLA issues two types of foreshore permits. The Mudlark permit is only issued to members of the Thames Mudlark Society. To apply for membership you must meet certain criteria, held a Standard Permit for two years and have a record of reporting finds to the Museum of London. As from 1st January 2019, the new 3 year cycle starts and all permits issued from that date will expire on 31st December 2021. With effect from 1st January 2019, all foreshore permits must be paid for in advance. Once payment has been received the application will be processed and your card produced. Payment details can be found on page 10 of the application form. You can also pay by PayPal using the button below. Please note: The PLA no longer accept postal applications. The Thames foreshore is potentially hazardous and some dangers may not always be immediately apparent. The Thames rises and falls by over 7.0m twice a day as the tide comes in and out. The current is fast and the water is cold. Anyone going on the foreshore does so entirely at their own risk and must take personal responsibility for their safety and that of anyone with them. In addition to the tide and current mentioned above there are other less obvious hazards, for example raw sewage, broken glass, hypodermic needles and wash from vessels. Steps and stairs down to the foreshore can be slippery and dangerous and are not always maintained. the tide; is it rising or falling? Always make sure you can get off the foreshore quickly – watch the tide and make sure that steps or stairs are close by. Finally, be aware of the possibility of Weil’s Disease, spread by rats urine in the water. Infection is usually through cuts in the skin or through eyes, mouth or nose. Medical advice should be sought immediately if ill effects are experienced after visiting the foreshore, particularly “flu like” symptoms ie temperature, aching etc. Why do I need consent? All the foreshore in the UK has an owner. Metal detecting, searching or digging is not a public right and as such it needs the permission of the landowner. The PLA and the Crown Estate are the largest land owners of Thames foreshore and jointly administer a permit which allows metal detecting, searching or digging. 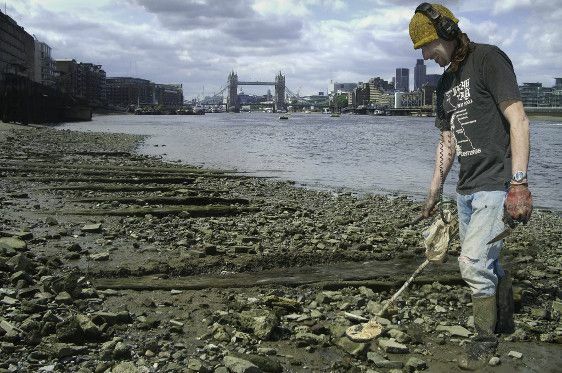 Where on the Thames foreshore can I dig, search or use a metal detector? Note: Other restrictions apply. For further details see the attached Thames foreshore maps and permit application form. 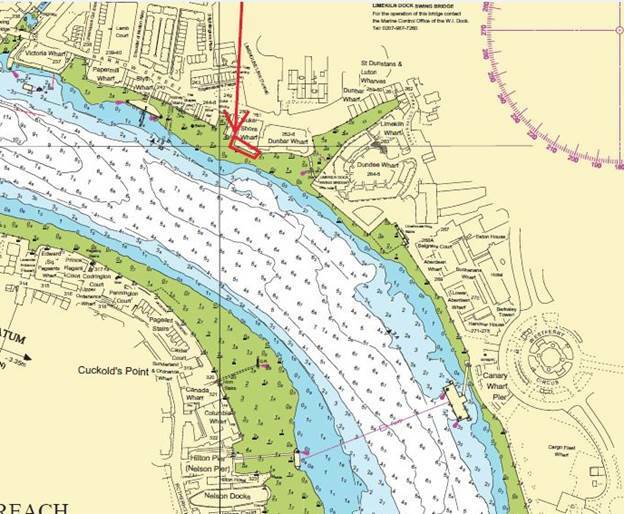 This is to warn you that the Port of London Authority has been advised that a section of the river wall at Duke Shore Wharf is a failing structure and the foreshore in the area must be avoided. 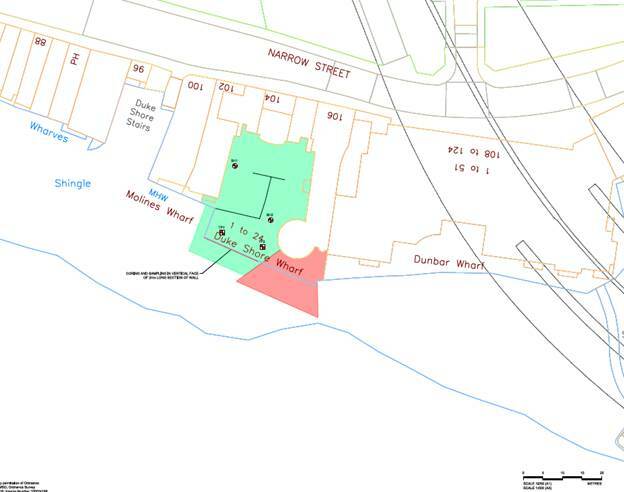 Temporary works which will support the wall were completed in 2017 and a permanent solution will be implemented in 2018..
Below are two images of the affected area, with the exclusion zone marked in red. You must report any objects you find which could be of archaeological interest to the Portable Antiquities Scheme Finds Liaison Officer at the Museum of London on 020 7814 5733. This Scheme records all archaeological finds made by the public in England and Wales. If you believe that a find may qualify as treasure then you should contact the coroner for the district in which the object was found, usually within fourteen days of making the find. In practice many finders report treasure via the Finds Liaison Officer, which is also acceptable. The coroner or finds liaison officer will give guidance on what to do. The Treasure Act code of practice contains a directory of coroners in the Thames area. Here is the full version of the Treasure Act 1996. The export of archaeological objects from the UK to any destination requires a UK licence if the object is more than 50 years of age. The type of licence required will depend on where the object was found and, in some cases, the value of the object. See the Arts Council website for further details.